An easy way to manage appraisal orders from your desktop or mobile device. Instantly connect to all of your clients using ValuTrac. Improve your productivity and service levels. ValuTracOne will keep track of your entire appraisal pipeline from all of your clients using ValuTrac. Connect to all your clients using ValuTrac Software. Manage your entire appraisal pipeline in one location. Receive notifications for new orders and messages instantly. Receive new order notifications, quickly review and accept. Accessible from any mobile device, iPhone and Android. Set inspection dates on the go, from your mobile device. Text your phone a download link to our iPhone and Android app. "Now I have the ability to access all my orders in one location"
"I work with a lot of different clients using ValuTrac Software. I was having to keep up with all my different logins and passwords for each client. To now have the ability to access all my orders through ValuTracOne is awesome. When I am out onthe road, I can now respond quickly to my clients through the ValuTracOne mobile app. It is simple to use and saves me a lot of time managing all of my orders." 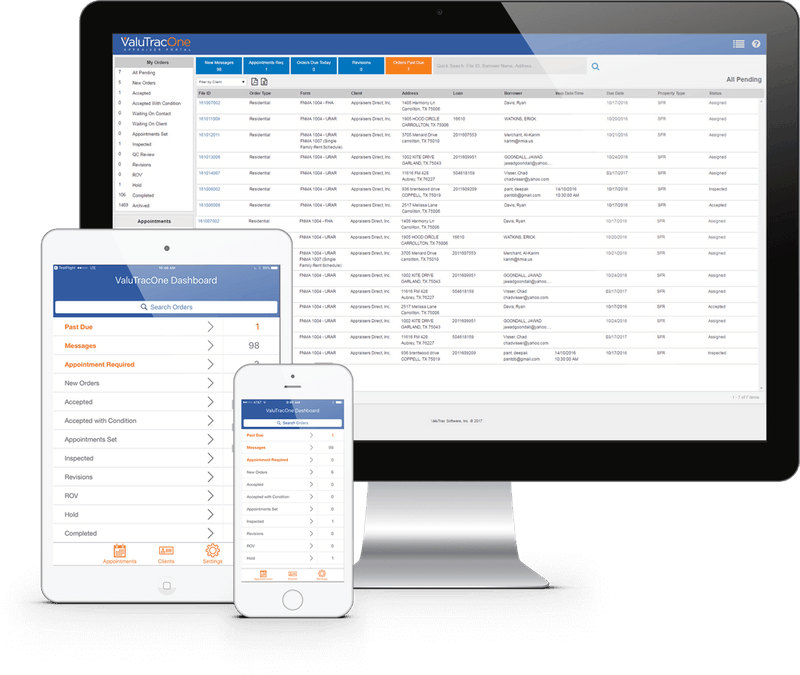 "ValuTracOne is a must have for appraisers"
"If your an appraiser that works with multiple clients using ValuTrac Software, this is a must have. I have further increased my productivity and the level of service to my clients. I get notified right on my phone when I have a new order or new message. This is awesome when I'm out doing inspections and I need to respond quickly. I highly recommend ValuTracOne." "ValuTracOne is by far the best app I have used to manage my appraisals"
"ValuTracOne is by far the best app I have used to manage my appraisals. 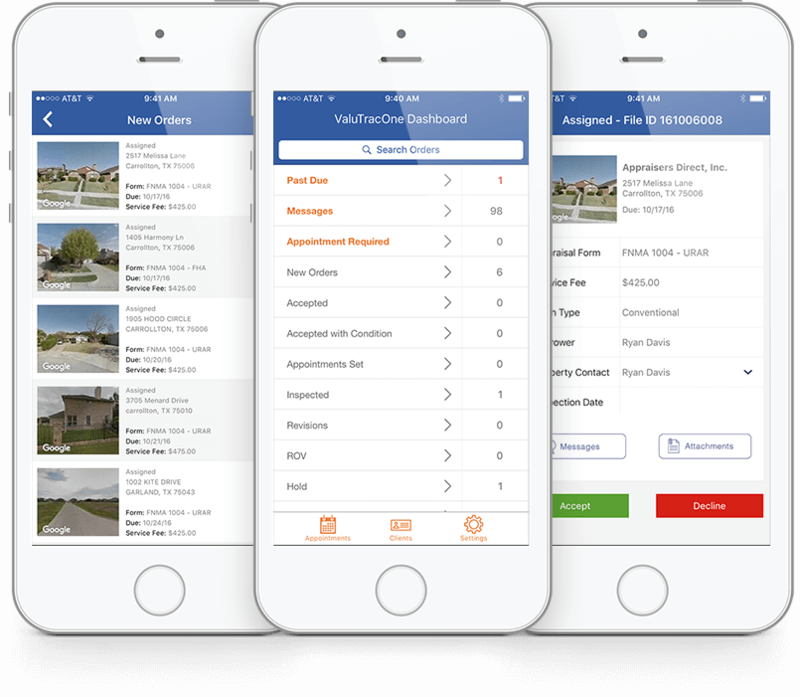 I work with eight appraisal management companies and now I can access all my orders in one location through the mobile app or on my computer. My favorite feature is the notifications, I can quickly and easily accept new orders and send messages. This is a life saver!" All the features at one low price. Billing starts 30 days from trial start date. Use FREE for 30 Days - You may cancel at anytime.